Lodging companies in Puerto Rico continue to struggle. Swiss Chalet, Inc. filed for Chapter 11 on Friday at the United States Bankruptcy Court for the District of Puerto Rico. The hotel and real estate company's petition lists approximately $118.5 million in assets and $132.7 million in liabilities. The petition lists the largest creditor as CPG/GS PR NPL, LLC of San Juan with an approximate $118 million disputed loan claim ($47.4 million unsecured). CPG/GS PR NPL, LLC is a joint venture created by Goldman Sachs and Caribbean Property Group. Contact Fowler at fstorms@nationwideresearch.com to receive a daily list of new chapter 11 filings in the lodging or any other industry. Debtor Name: SIGG Switzerland (USA), Inc. The petition lists approximately $57 million in liabilities including a disputed $32 million claim of Sovereign Bank ($4 million secured). Additionally, Roskamp Management Company, LLC is listed as an unsecured creditor with an approximate $19.4 million claim. 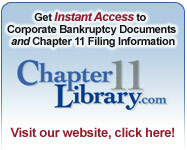 Sign up for our Chapter 11 creditor alert service now. Contact Fowler at fstorms@nationwideresearch.com for 415-773-1230 for details. Sign up for our lodging chapter 11 notification service now! Contact Ken at ktroubh@nationwideresearch.com for details.